Name Variation Joseph Hay Bell was also known as Hay. Joseph Hay Bell was born on 22 July 1862 at Pope, Illinois. He was the son of Joseph Hay Bell and Aurelia Ann Coleman. Joseph Hay Bell married Lilly Sloan, daughter of Wesley Sloan and Mary E. Wilcox, on 30 June 1891 at 2nd marriage for him. Name Variation John Griffin was also known as Griffen. John Griffin married Sallie T. Bell, daughter of Jacob Bell and Martha Hay Taliaferro. Name Variation Elizabeth Ann Palmer was also known as Lizzie. Married Name February 1879 As of February 1879,her married name was Tuttle. Elizabeth Ann Palmer was born in December 1853 at Wisconsin. She was the daughter of William Henderson Palmer and Sarah Sumner. Elizabeth Ann Palmer married William Francis Tuttle in February 1879 at Grant, Wisconsin. Elizabeth Ann Palmer was buried in 1943 at Milton Junction Cemetery, Milton Junction, Rock, Wisconsin. Elizabeth Ann Palmer had 4 with 3 living in 1900 children. She had 4 with 2 living in 1910 children. [S248] U.S. Federal Census 1860 U.S. Federal Census, by Ancestry.com, Year: 1860; Census Place: Paris, Grant, Wisconsin; Roll: M653_1409; Page: 521; Image: 539; Family History Library Film: 805409. [S246] U.S. Federal Census 1880 U.S. Federal Census, by Ancestry.com, Year: 1880; Census Place: Woodman, Grant, Wisconsin; Roll: 1427; Family History Film: 1255427; Page: 407B; Enumeration District: 129. [S245] U.S. Federal Census 1900 U.S. Federal Census, by Ancestry.com, Year: 1900; Census Place: Milton, Rock, Wisconsin; Roll: 1815; Page: 1A; Enumeration District: 0188; FHL microfilm: 1241815. [S250] U.S. Federal Census 1930 U.S. Federal Census, by Ancestry.com, Year: 1930; Census Place: Madison, Dane, Wisconsin; Roll: 2567; Page: 8A; Enumeration District: 0040; Image: 18.0; FHL microfilm: 2342301. William Francis Tuttle was born on 15 August 1840 at Massachusetts. He married Lizzie M. Sawyer on 18 January 1866 at Massachusetts. William Francis Tuttle married Elizabeth Ann Palmer, daughter of William Henderson Palmer and Sarah Sumner, in February 1879 at Grant, Wisconsin. William Francis Tuttle and Lizzie M. Sawyer were divorced in February 1879. William Francis Tuttle was buried in July 1931 at Milton Junction Cemetery, Milton Junction, Rock, Wisconsin. He died in July 1931 at Madison, Dane, Wisconsin, at age 90. [S247] U.S. Federal Census 1870 U.S. Federal Census, by Ancestry.com, Year: 1870; Census Place: Richland, Richland, Wisconsin; Roll: M593_1734; Page: 678A; Image: 259; Family History Library Film: 553233. Married Name Her married name was McClain. Unknown (?) married John McClain, son of Matthew McClain and Mary (?). Unknown (?) was born between 1801 and 1810. 1830 Warren, Tennessee Unknown (?) was referenced on John McClain's household in the 1830 Census at Warren, Tennessee. (?) McClain was born between 1825 and 1830. He was the son of John McClain and unknown (?). 1830 Warren, Tennessee (?) McClain was referenced on John McClain's household in the 1830 Census at Warren, Tennessee. She was the daughter of John McClain and unknown (?). Clarence Knox was born on 10 December 1904 at Grant, Wisconsin. He married Gretta H. McPherson, daughter of Arthur McPherson and Orpha C. Gillilan, on 5 June 1929. Clarence Knox died on 11 June 1988 at Madison, Dane, Wisconsin, at age 83. (?) Felderman married Louella McPherson, daughter of Arthur McPherson and Orpha C. Gillilan, after 1964. Name Variation Maude E. McPherson was also known as Maudie. Maude E. McPherson was born on 28 January 1905. She was the daughter of Arthur McPherson and Orpha C. Gillilan. Maude E. McPherson died on 25 February 1907 at age 2. Name Variation Jennie M. McPherson was also known as Jenny. Jennie M. McPherson was born on 13 November 1903. Jennie M. McPherson died on 19 February 1907 at age 3. Married Name before 1933 As of before 1933,her married name was McPherson. Florence E. Miller was born on 6 December 1913. She was the daughter of William Miller and Clara Glazier. Florence E. Miller married Clifford S. McPherson, son of Arthur McPherson and Orpha C. Gillilan, before 1933. Florence E. Miller died on 13 November 1988 at Platteville, Grant, Wisconsin, at age 74. William Miller married Clara Glazier. Married Name Her married name was Miller. Clara Glazier married William Miller. Name Variation James Clarence Knox was also known as Jim. James Clarence Knox was born on 29 November 1941 at Platteville, Grant, Wisconsin. He was the son of Clarence Knox and Gretta H. McPherson. James Clarence Knox died on 6 October 2012 at age 70 James Clarence Knox passed away on Oct. 6, 2012. Jim was born on Nov. 29, 1941, to Clarence and Gretta Knox in Platteville. He married Kathleen (McCabe) Knox on June 14, 1964. They have two daughters, Lezlie Knox (John Symms) and Sara Hook (Shawn Hook) and two grandsons, Alexander Symms and Corbin Hook. Other survivors include his brothers, Clayton and Douglas (Karen) Knox. He taught geography at the University of Wisconsin-Madison since 1968, retiring as Evjue-Bascom Professor in 2011. His teaching load routinely included a large introductory course along with advanced courses in geomorphology. Jim supervised the completion of 30 Ph.D. dissertations and 55 M.S. theses in geography and frequently sat on committees in external departments. His former graduate students hold many of the most prominent positions in the field of physical geography. Professional honors given to Jim Knox Fellowships from the Geological Society of America and the American Association for the Advancement of Science. He received multiple awards from the Association of American Geographers for his research and service to the profession. He authored or co-authored ~90 research publications which appearing in journals such as Science and Nature. In addition to his active career as a teacher and scholar, he enjoyed Badger Football and Basketball, genealogy, and spending time on the family farm. Jim’s Irish setters brought much happiness to his life. He was proud that both daughters followed him into education and thrilled that his grandsons delight in science. A memorial service will be held at 12:00 pm on Friday, October 12, 2012 at CRESS FUNERAL HOME, 3610 Speedway Road. A visitation will take place from 10:00 am until the time of service. In lieu of flowers, the family requests memorials to the UW Department of Geography, 550 N. Park Street, Madison WI 53706. Name Variation Evelyn Helmer was also known as Hellmer. Married Name 7 June 1938 As of 7 June 1938,her married name was Wunderlin. Evelyn Helmer was born on 26 August 1913 at Harrison, Grant, Wisconsin. 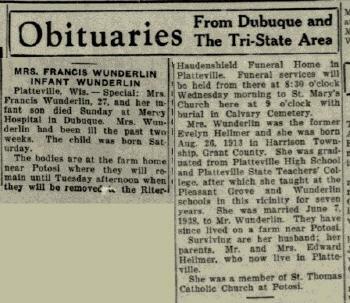 She married Francis I. Wunderlin, son of Francis I. Wunderlin and Maude C. Horner, on 7 June 1938. Evelyn Helmer died in March 1941 at age 27 mother and baby died together; Mrs Francis Wunderlin (Evelyn Helmer) and infant obituary. Mervin C. Broihahn was born on 28 August 1928. He was the son of Frederick Broihahn and Elizabeth Keehner. Mervin C. Broihahn died on 23 October 2011 at age 83 Mervin C. Broihahn, age 83, of Platteville, passed away at his home surrounded by his family on Oct. 23, 2011, after a courageous battle with cancer. He was born on Aug. 28, 1928, in Rockville, the youngest child of Frederick and Elizabeth (Keehner) Broihahn. He was united in marriage to Berniece Langkamp on Dec. 30, 1950, at St. Mary's Catholic Church in Platteville, prior to deployment in the Army. Mervin was a licensed cheese maker and milk truck operator until he and Berniece began farming in 1957. After leaving farming in 1970, he worked for the University of Platteville, retiring from the plumbing department in March 1991. After retirement from the university, Mervin kept busy by working for the First National Bank of Platteville as a bank runner for more than 13 years and with NAPA auto parts. He spent the majority of his time, however, doing what he loved most, applying his handyman skills to helping family, neighbors and friends fix and build things. He is survived by his loving and devoted wife, Berniece; children, Peg (Don) Kershner of Sun Prairie, and Fred (Amy) Broihahn of Madison; grandchildren, Amy (Scott) Gilmer, Angie and Kelly Broihahn, Zach, Brent and Paige Kershner, Jenna, Jake and Joey Broihahn; and a great-grandchild, Aidan Gilmer. He is further survived by a sister, Sylvia Schmitz of Lancaster; brother, Lester (Shirley) Broihahn of Lake Geneva; sister-in-law, Pat Broihahn of Lancaster; and many other family members and friends who lifted his spirits with their visits during his illness. He was preceded in death by his parents; children, Mervin Michael Broihahn on July 14, 2011, and infant daughter, Barbara Jean; and siblings, Carrie, Hubert, Ray, Rose, Mary, Ivan, Ivanelle, Alma and Ed. Funeral services will be 10:30 a.m. Thursday, Oct. 27, 2011, at ST. MARY'S CATHOLIC CHURCH, Platteville. Burial will be at Calvary Cemetery, Platteville where military rites will be accorded by American Legion Post No. 42 and VFW No. 5274. Friends may call from 5 p.m. - 8 p.m. Wednesday at the MELBY-BENDORF FUNERAL HOME and CREMATORY, Platteville, where there will be a parish rosary at 8 p.m. Friends may also call from 9:30 a.m. until the time of the service at the church on Thursday. Memorials may be made to Southwest Health Center Hospice, 1400 Eastside Road, Platteville, WI 53818. Virgil W. Riesselman was born on 27 August 1933. He was the son of Virgil Riesselman and Eleanor Lang. Name Variation Mervin Michael Broihahn was also known as Mike. Mervin Michael Broihahn was born on 25 October 1951 at Iowa. He was the son of Mervin C. Broihahn. Mervin Michael Broihahn died on 14 July 2011 at Grant, Wisconsin, at age 59. Barbara Jean Broihahn was the daughter of Mervin C. Broihahn. Barbara Jean Broihahn died at died in infancy. Frederick Broihahn married Elizabeth Keehner. Married Name Her married name was Broihahn. Elizabeth Keehner married Frederick Broihahn. Married Name Her married name was Seils. Unknown (?) married William Paul Seils Sr., son of Otto Paul Seils and Louise Elizabeth Koepp. Name Variation Adolph Oscar Koepp was also known as Otto. Adolph Oscar Koepp was born on 9 February 1901 at Excelsior, Sauk, Wisconsin, also reported as 8 Feb 1901. He was the son of Herman F. Koepp and Mary Zastnow. Adolph Oscar Koepp died on 22 July 1980 at Orange, California, at age 79. [S244] U.S. Federal Census 1910 U.S. Federal Census, by Ancestry.com, Year: 1910; Census Place: Excelsior, Sauk, Wisconsin; Roll: T624_1736; Page: 7A; Enumeration District: 0113; FHL microfilm: 1375749. Herman Carl Koepp was born on 25 June 1903 at Excelsior, Sauk, Wisconsin. Name Variation Helena Alida Koepp was also known as Alyda. Name Variation Helena Alida Koepp was also known as Alida. Helena Alida Koepp was born on 24 May 1905 at Excelsior, Sauk, Wisconsin. She was the daughter of Herman F. Koepp and Mary Zastnow. William Koepp was born circa May 1909 at Wisconsin. Edwin Frederick Wilzewski married Myrtle C. Seils, daughter of John A. Seils and Fredrica Grosinske. Edwin Frederick Wilzewski was born on 13 September 1888 at Wisconsin. He died on 13 December 1918 at Sauk, Wisconsin, at age 30.